Last week, Fatima Diez, Brand & Communications Manager at Five Guys took to the YMS17 stage to discuss big vs little marketing and whether a big marketing budget really matters. Here she shares her insights on the industry and why the Five Guys crew make coming to work so fun. What’s the story behind Five Guys and how long have you been in the UK? Five Guys was born in 1986 in Arlington, Virginia, when Janie and Jerry Murrell gave their four sons the following advice: “start a business, or go to college”. At first, the Five Guys were Jerry and his sons, until the fifth brother, Tyler, was born. Since then, the brand gets its name from the five brothers, who still work for in the company: Matt and Jim oversee operations, visiting stores around the US, Chad is in charge of training, Ben selects the franchisees, and Tyler manages the bakery. During the first 15 years, the Murrell family opened and worked at 5 restaurants. In 2002 they opened the door to franchisees, eventually becoming the fastest-growing restaurant chain in the US. The chain landed in the UK in 2013, with the first location in Covent Garden, London. In these three years, we have become not only the fastest-growing restaurant chain in the UK, but also we have recently been chosen the UK’s favourite fast food brand, for which we are really grateful. We are opened our first restaurant in France August last year, as well as a first restaurant in Spain last October. What makes Five Guys different? We believe in the freedom to create your own burger, which is why we offer free toppings for all our sandwiches. There are over 250,000 possible combinations to choose from to make your sandwich, and over 1000 possible mixes for your milkshake. Also each restaurant has its own Coca-Cola® freestyle machine with over 125 different soft drinks. Five Guys has become a cult brand with many loyal followers, called Five Guys Fanatics, who appreciate an authentic burger, and enjoy our friendly and energetic environment. They value the effort behind each detail, and we put all our efforts in offering them our best product and service. This follows a simple philosophy: to perfect and serve. What’s your secret to being a successfully disruptive newcomer in quite a crowded market space? 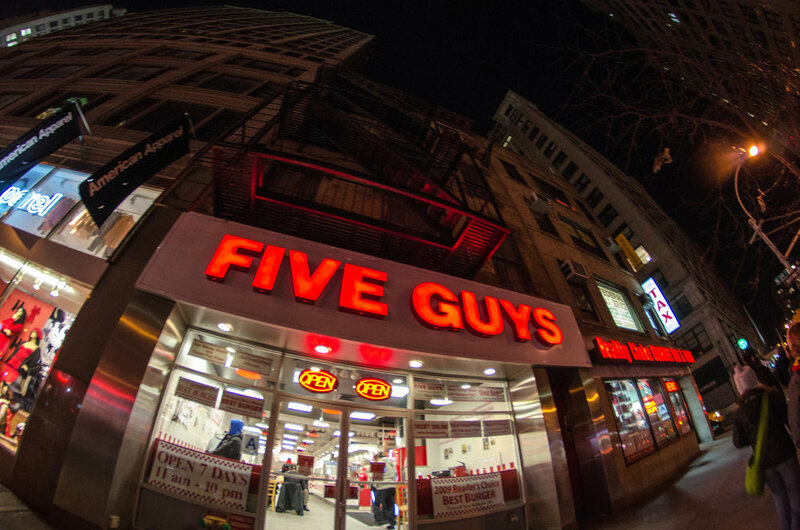 As one of the first better burger brands in the US, Five Guys has stayed loyal to its values worldwide. While the burger market has been thriving in recent years, Five Guys arrived to the UK in 2013 to bring a mix no other big player does: Full customisation, freshness, and quality. The simplicity of our menu allows customers to create a product they can call their own, so you can have your ideal burger each time you visit us. Together with the food, a genuinely friendly service both in-store and online (something unfortunately not as common as it should be) with a happy and enthusiastic crew, it’s what turns customers into Five Guys Fanatics. Is the youth market one that you actively set out to target or have you attracted them organically along the way? We try to never think of a demographic when thinking how we can serve our customers better. We think of people who share a certain personality and interests, who would get along with Five Guys if it was a person. Young people today have grown up surrounded by marketing activities, and can perfectly see through it when a brand is trying to sell them something. I think they appreciate the authenticity of our behaviours, from the way the food is hand-prepped and cooked in front of them, to the personal treatment they receive both in-store and on social media. Five Guys’ philosophy is “to perfect and serve”: create something that so good, you can be proud of serving it. We base our success on word of mouth, and always make sure that our crew understands that they are the greatest marketing system we can have. To boost word of mouth, we rely on social media, which allows us to maintain and grow relationships with fanatics in a personal way. What trends are you seeing when it comes to young people and the fast food industry? We can see lately that traditional rules are flying out the window, especially for young people. They’re just as likely to have a date, meet friends, study, or hang out in a coffee shop as they are in a burger restaurant; as long as they feel comfortable there and relate to the brand. I think it was when Five Guys opened in Bercy Village (Paris) last summer. Prior to Five Guys I had worked on a big fast-food brand that relies on more traditional marketing, so going into a new country where very few people knew what Five Guys was, without a budget for advertising and big stunts, was something completely new and a little scary. Everyone outside the company kept telling us we should do some campaign and big opening party, but this brand keeps proving traditional views wrong: We had customers and vloggers waiting to try the product for hours before opening, showing once again the power of word of mouth. It amazes me every time. I’m definitely hooked on Instagram, but my favourite is Pocket. Nowadays we have an overload of information available, and this app helps me not miss or forget about thing I am interested in. it’s a really simple concept, easy to use, and makes my commute so much more exciting! I’m quite reluctant to posting (or liking) selfies on Instagram; I believe the back camera of your phone can tell a much better story than the front one. The first question that comes to mind is “Why Five Guys?”, I get asked that a lot. Eating burgers is of course an awesome perk, but what really makes this company special is the people: our crew and our fans. When working in an office, it’s quite easy to lose yourself in data, analytics, and pretty pictures, but we go in the restaurants very often, and the cheerfulness and passion of our crew is amazing and contagious. That energy and all the love we receive from customers, both through compliments and in-store, are really rewarding. Join us for our upcoming events YMS18 NYC in October and YMS19 LDN in April to learn more about the valuable youth market from Gen Z's favourite brands.